On this fast-paced adventure we explore China's many highlights, from a section of the impressive Great Wall to Xian's Terracotta Army. Cruise through the Three Dams on a Yangtse River Cruise and on the Li River to peaceful Yangshuo before finishing off in modern Shanghai. Yangtse River Cruise - Float through the mesmerising Chinese countryside in comfort. Our tour begins today in Beijing. After a briefing with the Tour Leader the rest of the day is left free to relax after the flight. Beijing is China's capital and its political and cultural centre. The city has been the capital for most of the period since Kublai Khan made it the capital of his mighty Asian Empire in the late 1200s. All clocks in this vast country are set by Beijing time despite the westernmost regions being some 5000kms away. After walking through the infamous Tiananmen Square we shall visit the Forbidden City, the one-time home of the Ming and the Manchu (Qing) emperors and a treasure trove of eastern wares. Today we drive out to a renovated part of the Great Wall at Mutianyu, situated 90km north of the city. Began in the 3rd century BC by Shi Huangdi, thousands of conscripted workers laboured on it and many lie buried in its brick and stone ramparts. It is incredible to think that this wall spans the entire country! Here there is a 2km section to walk along with watchtowers and views of the surrounding countryside. En route we may also get to visit a cloisonné workshop where you can see examples of this ancient metal-working technique. In the late afternoon we transfer to the train station where we board our sleeper train for Xian. We arrive in Xian this morning and after taking breakfast at the hotel we begin to explore. Xian (Changan) served 11 dynasties and was the very starting point of the Silk Road between Central Asia and Europe. Its ancient monuments include the Big Wild Goose Pagoda (64m, a 7-storey high structure with a superb overview of the city) and the Great Mosque, a wonderful 15th century working mosque within the old Muslim Hui District, which we include in our sightseeing tour. The afternoon is free but highly recommended is an optional visit to the Shaanxi National Museum which takes us through a million years of Chinese history. Today we visit one of the highlights of any visit to China - the magnificent Terracotta Warriors and Horses who guard the Qin Shi Huangdi Tomb. There are literally thousands of lifesize warriors, dating from 200BC. This dramatic find of the 1970s is considered one of the greatest archaeological discoveries of the century. We should have time to stop at the on-site factory to see how the warriors are made today. In the late afternoon we board the high speed bullet train to Chegdu. This morning we drive to the Panda Research Centre to see the animal synonymous with China. Operational since 1990, the centre covers an area of some 92 acres and is home to a many Giant Pandas, who roam in their large leafy enclosures. The ultimate aim of the centre is to reintroduce Giant Pandas back into the wild, in such numbers as to ensure their survival, and the centre's nursery has enjoyed a success rate with new-born pandas over the past few years that has been quite extraordinary. After our visit we will return to the city and transfer to the local railway station for the bullet train to Chongqing. This morning we visit the cliff sculptures at Baoding Shan (Precious Summit Hill). It is fascinating to wander beside the many brightly painted images carved into the rock face, amongst the most impressive of which is an enormous reclining Buddha, 31m long and 5m high! We then return to Chongqing for dinner before boarding our riverboat for a two and a half day cruise along the Yangtse River. The longest river in China, the Yangtse runs through nine provinces forming a delta in the south which has attracted a very high population density to the region. 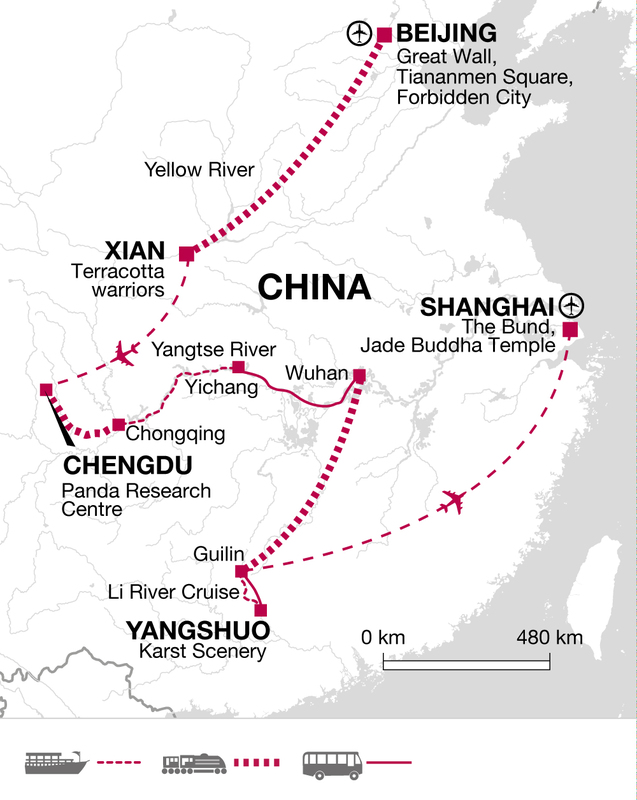 In addition, the river flows through important industrial centres which form the economic heart of China. We travel on board a five star cruise boat fully equipped with two berth air-conditioned cabins. Our boat carries approximately 150 passengers with your fellow travellers likely to come from a variety of different countries. Today is spent relaxing on board as the scenery of the Yangtse drifts by. During the journey the boat will stop and visit Shibaozhai, the Precious Stone Fortress, a dramatic 9 storey temple set at the top of a 20o m tall cliff. If there are sufficient passengers wishing to take part, the boat will make a stop at the Fengdu 'ghost town' and you'll be able to alight and explore this large complex of shrines, temples and monasteries dedicated to the afterlife. 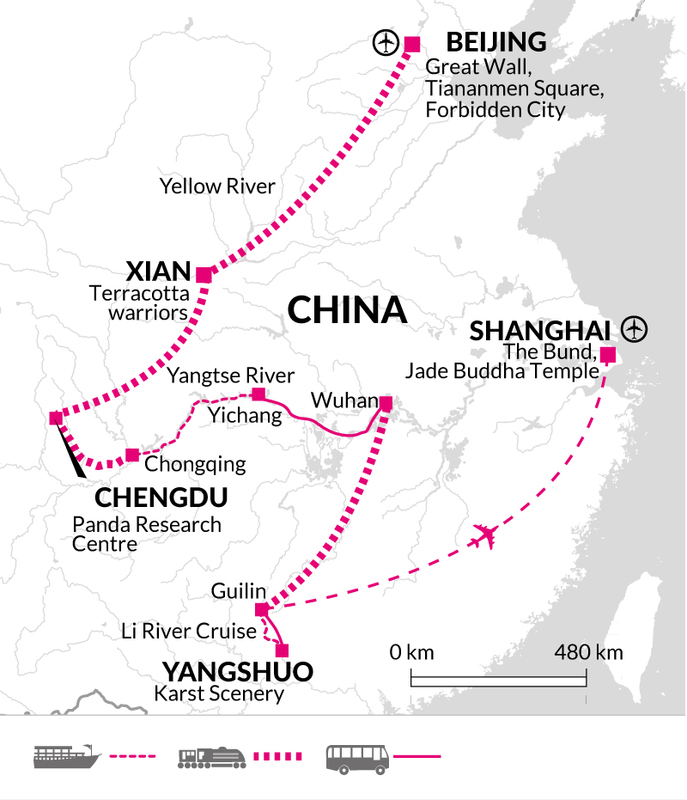 Our journey will take us 193km through the 'Three Gorges', each one spectacular in its own way. The first is Qutang Gorge which is only 8 km long. This was always considered a treacherous but necessary part of the river as it was the only way to reach Sichuan province from the eastern lowlands, which are surrounded by impassable mountains. Whilst travelling through the gorge there is the option to visit Baidicheng, an ancient hilltop temple complex also known as the White Emperor Walled City. After passing through Qutang Gorge, we enter Wu Gorge and take a side trip up Shennv stream to admire some of the smaller gorges feeding in to the Yangtse. Wu Gorge is 40km long and it follows a relatively calm stretch of river. Surrounded by hazy mountain peaks, this mystical section of the Yangtse is steeped in legend. Continuing downstream we pass through the third and final gorge, Xiling Gorge, once renowned for its fast flowing rapids but now tamed by the Three Gorges Dam further downstream. Later this evening, after dinner, we finally reach the dam itself and make the descent down the impressive series of locks. This morning we'll visit and take a tour of the dam and learn about this amazing project, one of the great engineering wonders of the world. We then disembark and take a short transfer to Yichang East train station we take a bullet train to Wuhan before changing to a standard train for the remainder of the journey to Guilin. We arrive in the early evening and check in to our hotel. After breakfast we head to the MoPanShan Dock where we board our boat on the Li River and cruise to Yangshuo. Lunch is taken aboard the boat during the journey as we pass along the most scenic stretch of the river. We will pass paddy fields, villages and stunning limestone scenery en route. An afternoon arrival in Yangshuo offers the opportunity to explore this laid back town. During this free time you may wish to take one of the optional bike rides or walks in the surrounding villages. Alternatively you could head to one of the many limestone pinnacles around the town, the best known being the Moon Hill. Yangshuo has a lot to offer so the day is left free for you to explore at your own pace. You can walk into the surrounding karst summits or hire a bike and cycle through country back lanes. Alternatively, you can soak up the atmosphere of this beautiful riverside town. You may want to practice your bartering skills in the local market - selling batiks and silk paintings, or you may be tempted to buy a 'Little Red Book'. This evening you may choose to go to an amazing sound and light show (optional). Departing Yangshuo we drive to Guilin where we board a flight to Shanghai. Shanghai is one of Asia's most vibrant and dynamic cities. It began as a fishing village in the 11th century, but after the end of the first opium war and of the five newly opened treaty ports Shanghai soon became the most cosmopolitan city, with Asian, Russian, European and Jewish influences. Here were cabarets and ballrooms, fine shops and satirical newspapers, and with such style and influence Shanghai was dubbed the 'Paris of the Orient'. Today its elegant past is still noticeable as you walk down 'the Bund'. This wide avenue is a good place to start to get to know the city. Today we make a city sightseeing tour to visit the famous Jade Buddha temple with its white jade statues, continuing on to the 16th Century Yu Yuan Gardens. We also visit the museum which houses some very good examples of Ming pottery. In the evening you may wish to see the city's world famous troupe of acrobats (optional). Beijing - Summer Palace, £4 (entrance only); Opera, £15. Acrobat show, £24. Hutong tour inc lunch, £16. Yangshuo -Sound and Light show £21.00 (£26 for VIP seat) ; bicycle hire £5.00; painting lesson £5.00; caligraphy lesson £8.00; cooking class £15.00. Yangtse River Cruise - All optional excursions during the cruise require a minimum number of participants so we cannot guarantee that they will be available on every journey. Light rainwear is advisable at all times. One main piece and a daypack. Remember, you are expected to carry your own luggage - so don't overload yourself. Whilst walking on the Great Wall your main luggage will be left on the vehicle or in the hotel. You should carry a daypack containing water, sunscreen and a hat at the very least. It is essential that your baggage is lockable to comply with local aviation regulations. Please be aware, before boarding a flight in China that the Chinese authorities will only allow bottles onto aircraft if they have been checked in as main luggage. Any bottles in the hand luggage may be confiscated. Bring a sunhat, insect repellent, torch and waterbottle. You may find rehydration salts useful. Although entirely voluntary, tipping is a recognised part of life in this region of the world. Some local staff will look to members of the group for personal recognition of particular services provided. Accordingly, you should allow approximately £35 for tipping. As tourism developed relatively recently in China, accommodation is usually modern, spacious and comfortable, albeit rather generic. Most hotels are large and purpose built and though rarely characterful, you can generally rely on good facilities. In major cities the hotels that we use are of international style generally with business facilities, restaurants and bars and all mod cons, though few have pools. In other cities and large towns the standard is similar although on a lesser scale. In small towns or villages where tourism is less prevalent, the hotels we use are smaller and facilities are more limited, though we generally stay in the best place in town. Rooms will still be en suite but can be basic. Plumbing and electricity supplies can be somewhat erratic and although the welcome is warm, service levels may be less efficient than you might expect. Please be aware that the beds in China are often quite firm and may take a few nights for you to get used to. All visa information is subject to change regularly, so please check with your local consulate for the most up to date advice for the countries you are visiting.